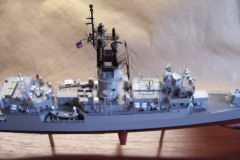 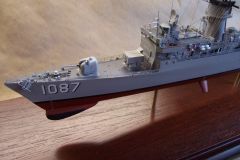 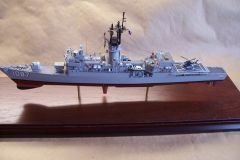 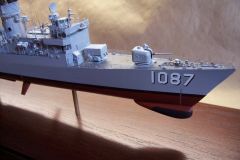 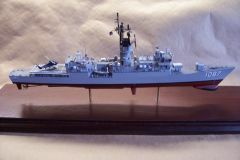 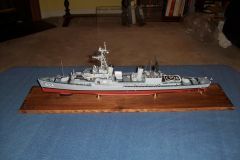 This is Orange Hobby's 1/350 scale resin kit of the USS Robert E. Peary, modified to reflect the USS Kirk (FF-1087) during the time I served on her 1979-81. 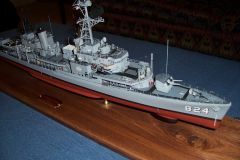 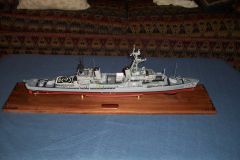 This is a build of Orange Hobby's 1/350 resin kit of USS Pegasus (PHM-1), fitted out to reflect a ship I served on in the early 80"s.
This kit is produced by the modeler's guild at the Chesapeake Bay Maritime Museum in St. Michaels, MD and is available in their gift shop or online store. 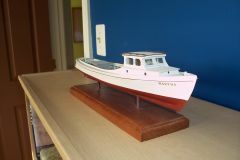 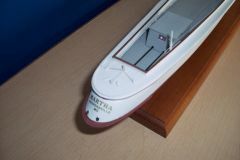 The Martha is one of CBMM's in-water working display boats. 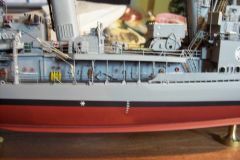 The design from the 1930's was very fast getting out to the oyster and crab beds but the complex stern was more than even skilled boat builders wanted to deal with. 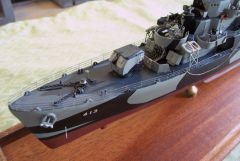 Well designed kit. 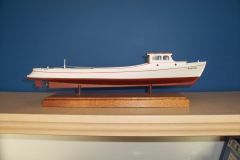 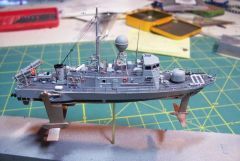 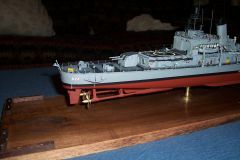 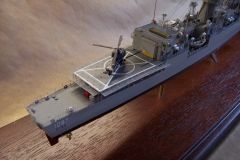 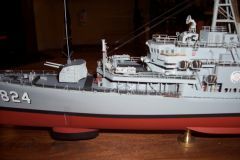 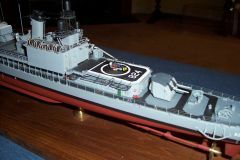 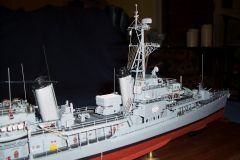 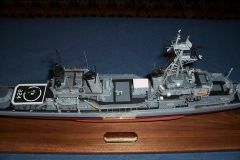 Build depicts the Basilone during her 1966 world cruise based on BJ's USS Gearing FRAM I kit. 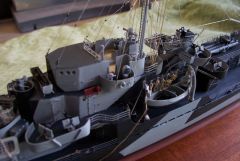 The kit is multimedia with solid wood hull, laser cut wood, Brittania metal, resin and PE brass and plastic shapes. 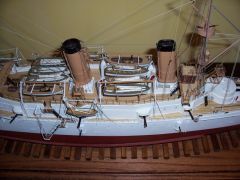 Numerous smaller details are scratch additions. 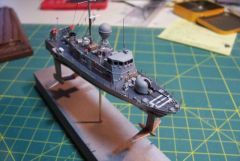 I completed this build a while back and had thought it was posted - guess not. 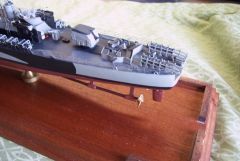 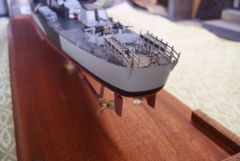 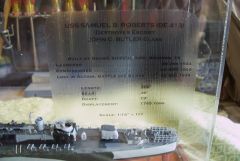 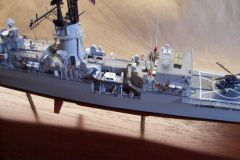 It is a 1/16" scale kit from Bluejacket, of one of the handful of DE's and DD's that turned back a powerful Japanese fleet during the Battle of Leyte Gulf. 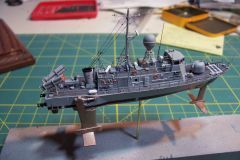 Build is 99% out of the box, only added details are on the 40mm mounts, some nav lights and the floater nets. 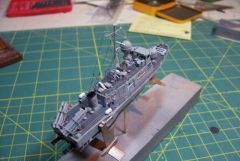 Great kit to break into solid hull kits. 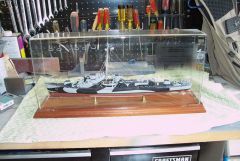 This is a repost. 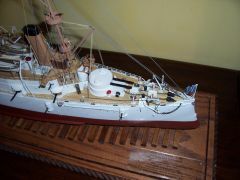 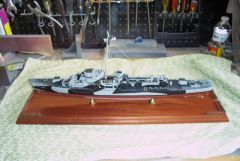 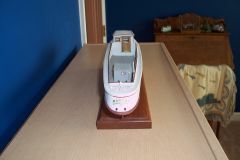 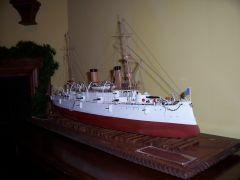 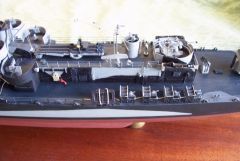 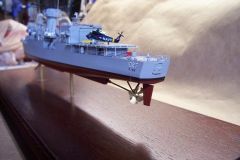 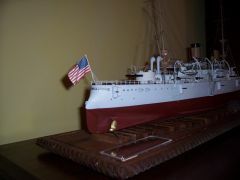 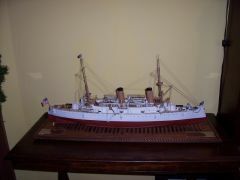 Photos are of USS Olympia kit from Bluejacket. 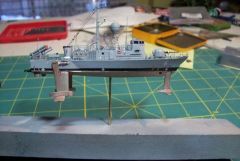 Build is about 85% out of the box. 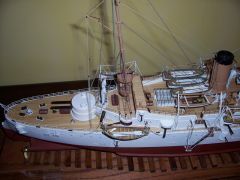 MoRope used to replace all rigging.